Smithfield, RI, August 8, 2018– AIM Joraco, a premier manufacturer of the Toggle-Aire® line of precision pneumatic & manual toggle presses, is thrilled to have their laser guided press used to create fine art for kids. When No Boundaries, Inc., had reached the point of “celebrity status” success with their line of wall art, they decided it was time to speed up their production process while maintaining their high standards of quality. They decided to ask AIM Joraco’s team of engineers for a complete application solution. AIM Joraco responded with their Toggle-Aire® 5-Ton Press that includes laser alignment to provide guidance to the operator for placement of the material along printed edges for precision cutting. 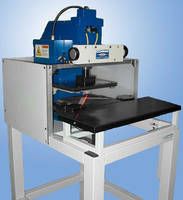 With this custom tool the user can cut fabric for their application with extreme accuracy. Per Tom Capp, the owner of No Boundaries, Inc., “AIM Joraco completely understood what our needs were, and they made the purchasing process a pleasurable experience.” In fact, a second system was purchased soon after delivery of the initial system. This is another example of AIM Joraco’s line of premium Toggle-Aire® pneumatic presses being modified to achieve ultimate success for the end-user’s application. 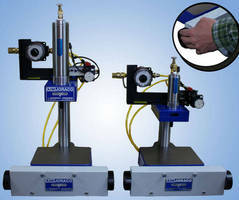 Andrew Lewis, President of AIM Joraco, commented on the topic, “There are many industries under-utilizing the power of the pneumatic press simply because they do not understand the seemingly unlimited means of modification. Customers like No Boundaries, Inc. challenge us every day, and all it takes is one phone call.” AIM Joraco has now successfully packaged and delivered similar systems for applications utilizing fabric, tissue and filter membrane for use within the medical industry including life science and regenerative tissue repair. 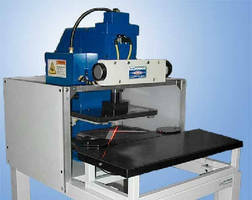 AIM Joraco (www.joraco.com) is known for manufacturing semi-automatic rotary machines, assembly and fabrication tooling, and Toggle-Aire’s® line of precision pneumatic and manual toggle presses. After entering the market over 60 years ago, the majority of the presses that have been manufactured are still in operation today. In effort to accommodate the ever-changing industrial needs of their customers the Direct-Aire® and Hydro-Pneumatic® Series press lines are currently being manufactured and distributed. Sample testing is free-of-charge and die sets, tooling and complete engineering support is available upon request. 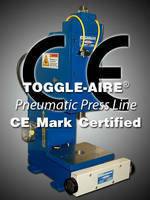 Offered with an industry leading 5-year warranty. All equipment is manufactured and shipped from AIM Joraco’s Smithfield, RI facility – All products are made in the USA! For more information, please visit: www.joraco.com, call us at (401) 232-1710 or email: sales@joraco.com.